Double Angle Milling Cutters are used for milling V-shaped slots, serrations and chamfers. Angle cutters are milling cutters with the cutting face angled with respect to the axis of rotation. There are many types of angle cutters. Examples include single angle cutters and double angle cutters. Single angle cutters are those which have teeth on the conical or angular face of the cutter and also on the large flat side. Keeping the diverse requirements of customers in mind our company provides excellent quality assortment of Double Angle Milling Cutter. This Double Angle Milling Cutter is available in different sizes and specifications. Our product range is known for its excellent performance and smooth finishing. Being a foremost organization in this industry, we are actively engaged in offering the finest quality range of Double Equal Angle Cutter. Our wide industry experience enables us to provide different types Double Angle Cutters that are known for dimensional accuracy and longer service life. 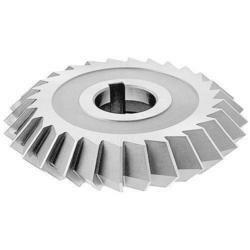 These cutters are widely used for general purpose machine and available at the affordable rates. 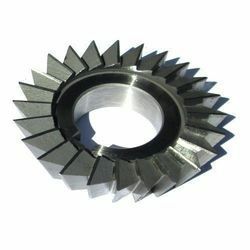 Moreover, these cutters are accessible in different sizes & specifications and suit the variegated requirements of the clients. P. J. Industries is manufacturing Double Unequal Angle Cutter as per drawings or customer's requirements.